Wipaq provides the corporate and other institutions the much-needed fingerprint scanner device which can identify not just fingerprints but also smart cards as well. It has a USB slot from where you can access the data, especially where there is a high flow of traffic like airports. Buy most advanced fingerprint scanners from Wipaq in Dubai, UAE. We advise our customers to select the best fingerprint readers according to their requirements and budget. Our fingerprints scanners are manufactured by top-most brands which include ZK Teco, Access TMC, and Matrix with unmatched capabilities to recognize even the complicated fingerprints. Fingerprint readers are available in various models and sizes that can be integrated with the latest scanning technology. 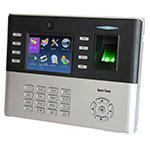 UA-200 Fingerprint reader can be accessed using wireless interfaces like Wi-Fi, GSM, and Bluetooth. 1.3MP colour camera allows taking Mug shot.Touch screen with LCD shows the status of the device. Highly preferable for heavy use. Normally iclock 990 comes with stunning UI design with the international element. Data backup and retrieve options are available in this device. Firmware protection is enabled with chip encryption. It has the access control interface which includes door lock, Wiegand in and out, sensor connection and alarm.